The electronic mails are now a days the basis to work in organizations. The employees in an organization communicate, work only by sending and receiving mails to each other. One may not deny the fact that using mails is a better and quick option to get the work done in offices, but is also of the main factor of distractions that may hinder the whole working process. While working in an office, the inbox of an employer will never go empty, rather it will by the time get filled without stopping. One may not stop the mails from coming, but can certainly get rid of it by setting a time period that when will a person check mail. One can set a stipulated time that once in the morning the mails will be checked, then once in the afternoon and last before leaving the office. This way one can avoid getting distracted after every few seconds. Also, you will be able to focus on the work. Remember, you are working in an office, so make sure not to do personal chores at the workplace. Home chores like to book a ticket online, checking the best holiday destinations abroad and so on are the task which should be avoided. These are the worst enemies of work and will waste time, will be a great hindrance. Spare some time at home and perform such tasks. Ring ring, are you tired of hearing this sound after every single minute that too while working on an important topic. Do you feel like answering every call when working in an office, obviously no, unless it is an important call. Also, you need not attend every call. Just make use of voice mail feature in phone calls and let the caller leave a message or tell the caller the time period when can you hear him or her. By doing this, your time will be saved and also the caller will not be neglected. Make sure you deal with urgent calls first and non urgent one’s afterwards. You are working in an organization no matter what size is it, one has to attend the meetings according to the requirement. Getting a call to attend meeting in conference hall one after another can obviously be very annoying as it may delay your work. Delayed work, then demands you to sit till late and complete the task, ignoring the fact that you are the early arrival in the office. So, to prevent such situation to come, it is better to speed up your hand at work, also set proper timings or schedule your projects to be completed in a day. Always schedule your task keeping in mind that next day any emergency meeting may arrive, so you should be prepared beforehand so that your work is not hindered. One cannot avoid the meetings as it is also the important part to regulate the work in an office, but one can certainly avoid rolling stones blocking your road to work. The office does not provide you with good food, then the only option is hunt for good and healthy food outside the office. Moving out of the office is obviously a sheer wastage of time as well as money. Not only this, who guarantees the outside food is always healthy. So, make sure that one gets the good food to eat within the office premises. One can even complain for a cafeteria and canteen in office, so that your need gets a voice. Whatsapp, viber are the recent applications that, no doubt, are a boon but are also the cause of hindrance while working. Ping !Ping! Within a blink of an eye is quite disturbing. It sheds away your concentration . While you start with an important work, make sure your whatsapp does not ping or it will surely hinder your work. One obviously cannot keep you mobile at home while you leave for the office but can keep it on silent, so that the such apps does not demand your attention. Ah! That‘s the favorite part of individuals. Purely a great entertainment source and believe it, chatting, gossiping is one thing one cannot get rid of very easily. Once a person starts, other employees get attracted thus the circle goes on increasing. A gossip worm once enters an individual, it is hard to blow it away. So, avoid gossips in office. Gossips and chat will only kill your time and is also a roadblock to work. It is apparent that after texting the whole Sunday night will make you feel sleepy the next day in office. The excitement of Sunday is the straightforward reason behind feeling sleepy in office. So, for this, it is always advisable to sleep early as the saying goes, “Early to bed is early to rise” and will not make you feel sleepy. Apart from this, another reason of feeling sleepy is sitting next to the laptop whole day can create tiredness in your eyes due to harsh light, so to avoid this, it is always better to take small breaks in between so as to freshen up yourself. This will boost you and will not let you feel sleepy while working in an office. In some of the organizations there is an availability of television. Although it is a good choice but at times it proves harmful because the workers get glued to it, leaving the work behind. It provides a heck of distraction, if you are not careful about this. It is good to watch television for entertainment, say, watch for a while during lunch or something, but should not get transfixed to it permanently. It is good to throw away boredom through television, but obviously not good to use it while working on something important matter. The surroundings you are working in can also be one of the factors of enduring in your work. If lightening is not proper if it’s too cold or too hot where you work, then it is your responsibility to make your environment work friendly. Using less or too much lightening in your working area is likely to affect your health and is ultimately a cause of hindrance in your work. No one will take a charge to provide you with the perfect ambience, only you have to find the correct level for yourself. One of the common and inevitable factor. Noise from within the office, outside noise of passing vehicles, screeching sound of pulling and pushing of doors, whispers of two employees talking, one sided telephone conversation etc. reduces our concentration level. To avoid this, you can close your doors, windows of your office or can even use headphone while working. Though the sound of vehicles cannot be avoided, yet to some extent it will reduce through headphones. People come and go within an organization. Outsiders or even the employees from within the firm sometimes have to go outside for some work. Then this coming and going of employees frequently creates disturbance in the mind and concentration level of a worker. Not just this, the clients may even come to your cabin without informing. So in such cases, one should quickly get to the point of leaving and not interrupting. This can be done by talking in a sugar coated manner or else it may create a cold war between the employees in an organization. Soothing music while working speeds up the pace of doing work, but if your work demands unflinching attention then it will always be better not to listen to the music, especially not directly in your ears as it can be your greatest hindrance. If you feel sleepy and is not able to concentrate then to divert your mind music will be helpful as it will not only act as a catalyst but will also empower you to work with a fresh mind. So, listening or not listening to the music depends on the type of work you are engaged in. Like while answering an important call, it is not good to listen to music as it will be regarded as a noise. So, above are the hindrances that one may come across during work. Avoiding these hindrances is must otherwise it can take a toll on your health as well as on the quality of your work. These hindrances are faced by employees at all levels in an organization. Be it, he is a lower level employee, or a boss. In all sizes of organizations the problems are same, be it a small organization or large size. 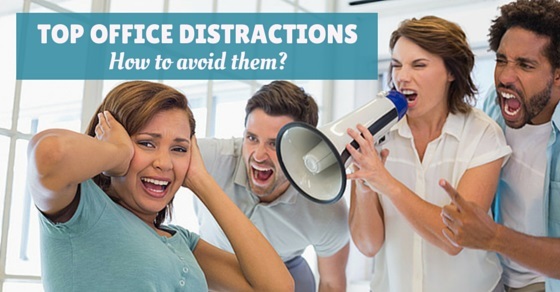 So face them and find solutions to avoid the hindrances especially while working, else it may affect your work and can even affect your image in an office. Previous articleWhat are the Best Strategies for Anger Management?